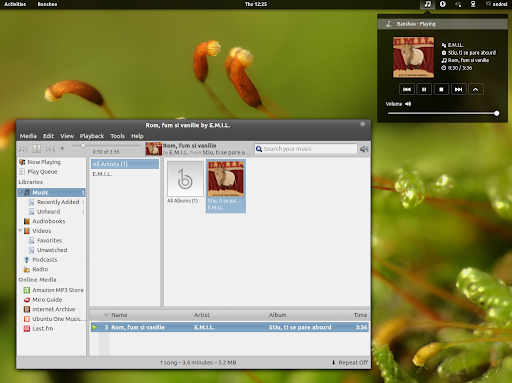 Mediaplayer GNOME Shell extension is now available in the WebUpd8 GNOME 3 PPA. This extension can control MPRIS capable media players from the GNOME Shell top bar. Currently it supports the following players: full support (meaning seek works too) for Clementine, Banshee, Rhythmbox, QuodLibet and Amarok and without seek support: Clementine, MPD, Pragha, Guayadeque, Google Music Frame, XBMC. GNOME Shell Mediaplayer Extension automatically detects your music player when you run it so you don't have to select it from the preferences or anything like that. However, if your music player is not on the supported players list, you can force the extension to support it by editing the metadata.json file under /usr/share/gnome-shell/extensions/ and adding it to the "players" list (but obviously, it will only work if it supports MPRIS). Once installed, restart GNOME Shell (press ALT + F2 and enter "r" or log out and log back in), then use GNOME Tweak Tool to activate it. (each of the above changes requires a GNOME Shell restart). Important: the extension shows up on the top panel only when a supported media player is running! Please don't report this as a bug.